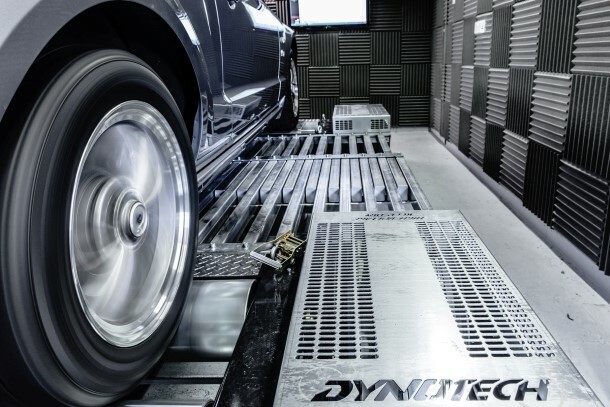 Our brand new 4wd Dynotech Rolling road is the very latest fully digital dyno from the world renowned Dyno Dynamics. 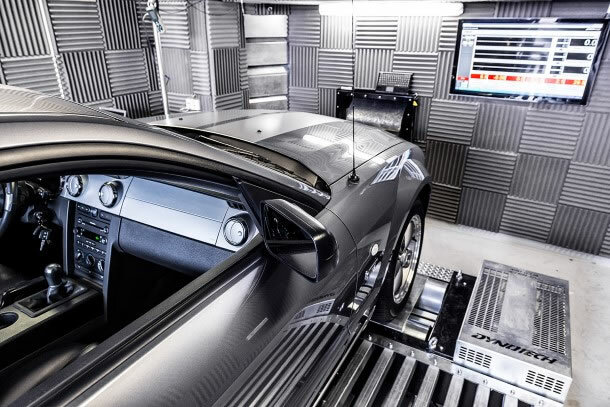 Its capable of measuring up to 2400BHP and is installed in its own custom built dyno cell next to our workshop. Do not confuse our rolling road dyno cell with lesser ones out there, it is a brand new, state of the art Dynotech 4wd by Dyno Dynamics and can measure up to 2400bhp at the wheels and load any car up for mapping safely at up to 600bhp per axle. (We can stop 1200bhp at the wheels dead with our retarders). 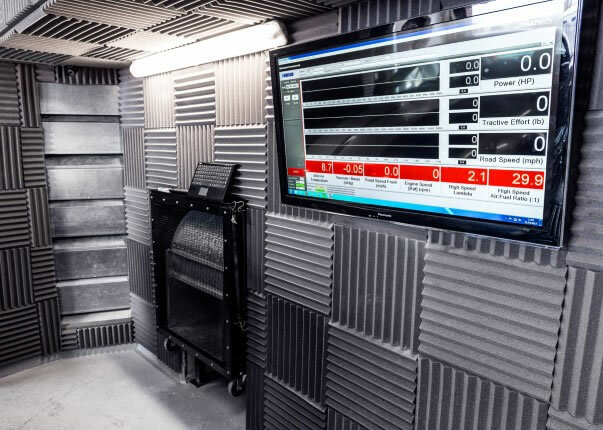 Our dyno is housed in its own custom built cell with a huge financial investment in not only the dyno's connectivity for maximum integration with diagnostic hardware and the cells amazing soundproofing, but also 3 very separate stages of cooling air. First of all we have 20'000cfm of high speed air being directed at the engine, ported from outside the cell so that it is always cold and fresh. Secondly, we have 5'000cfm of dedicated exhaust extraction which extracts through its own exhaust system through dedicated noise silencers and then out of the cell to atmosphere, and finally, we have up to 40'000cfm of airflow through our cell extraction fans, these fans will exchange the entire air content of the rolling road cell with fresh outside air every 4 - 5 seconds at between 20'000 and 40'000 cubic feet per minute depending on our requirements. this level of airflow is needed to keep your pride and joy as cool as possible in what can be a harsh dyno environment! Its essentially a rolling road dyno in a wind tunnel! The cell is also perfectly balanced. We maintain, through variable fan speed and electronic on screen monitoring, the perfect cell conditions to retain atmospheric pressure in our totally closed cell. There are very few dyno cell's in Europe capable of doing that properly, or that have even given it any consideration. Mapping a car in a positive pressure cell (more air coming in than going out) would mean calibrating it as though it had a turbocharger on it. Yet "tuners" still cant see why their cars run terrible on the tarmac but great on their dyno! The inverse is true in a negative cell, (more air coming out than going in) as that is like calibrating the vehicle for high altitude driving! We also not only have dual channel wideband AFR monitoring (dual channel is essential for most V engines with twin exhausts, otherwise you cant be sure both banks are balanced), but we can also monitor and graph every single output that a modern cars OBD2 data stream can offer, including boost pressure, knock levels, fuel pump and rail pressures, airflow meter outputs, injector duration, fuel trims, and literally hundreds of other useful data streams directly from your vehicles ECU to our dyno software. There are very few facilities in Europe that offer this level of graphing in a live environment on a dyno. Our dyno cell is also fully interfaced with the very latest top of the range "Snap On Verdict" wireless diagnostic hardware and lots of high end PC based software, allowing us to interrogate the vehicles hardware at dealer level whilst the car is being "driven" under laboratory conditions at up to 155mph, all without ever leaving our premises. The cell is complemented by the very latest automated weather station which calibrates the dyno perfectly on every single run, this mean absolute accuracy & repeatability. 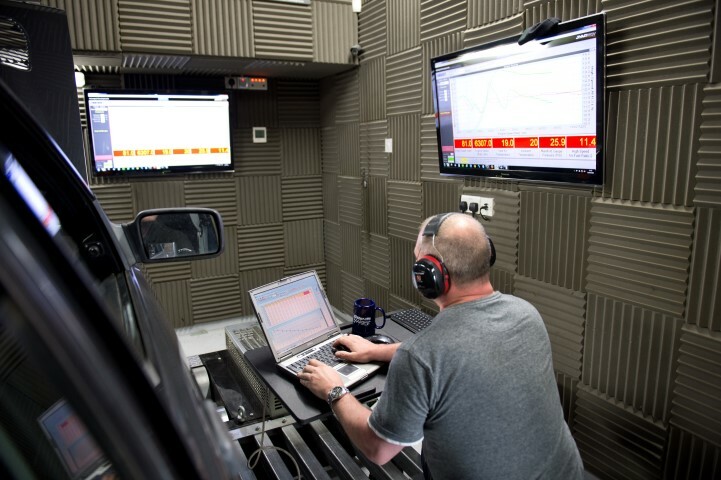 As professional ecu calibrators with over 100 dealers around Europe relying on our calibrations, we are only happy with good honest dyno results, regardless of what they may be! So beware - This dyno cell can be a heart-breaker! 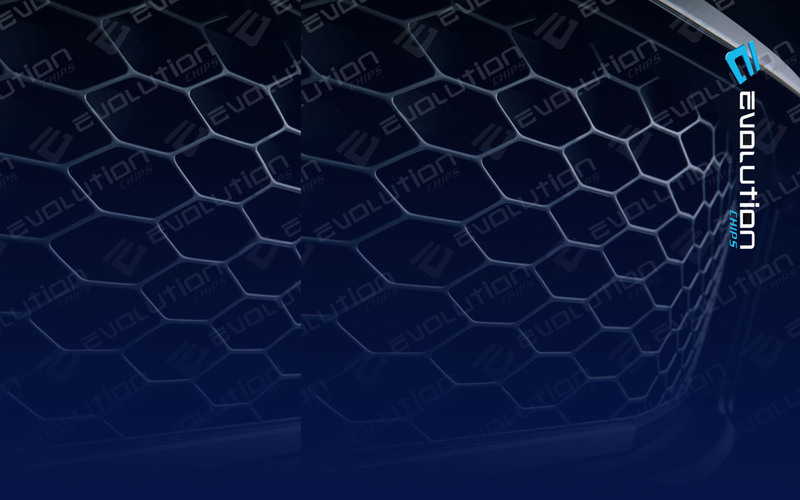 Its perhaps useful to know that your vehicle run data is held on our machine forever, meaning when you come back for further tuning, we can load up your old graphs and compare your new power to the old, no matter how long ago it was. 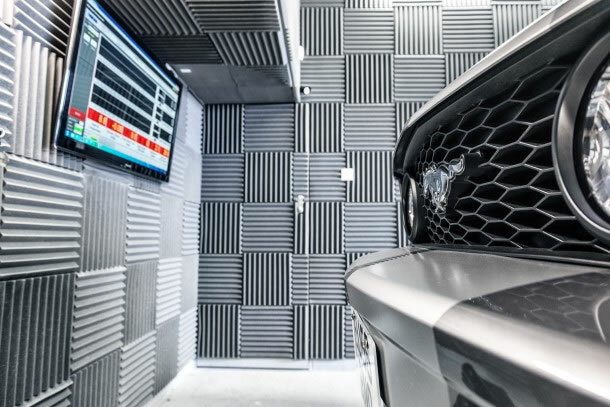 This facility is invaluable when tuning on a budget a little bit at a time, or for those constantly evolving vehicles that you just cant help but keep tuning! Want to bolt on an induction kit or a cam and see if it has altered your power, but haven't been on our dyno for 6 months? No problem. You can get your car on the dyno for as little as £72... so why not give us a call on 01253 508400 to book some dyno time?